Never ever kill rats with poison. It never solves the problem, and it just results in dead, rotting, stinking rats in your house. 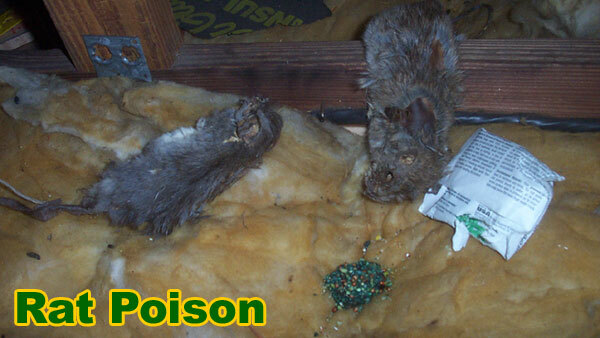 Read my article about Does Rat Poison Make Rats Thirsty and Make Them Die Outside? - because it doesn't - they die in the attic. Go to my How to Get Rid of Rats home page to learn how to solve a rat problem permanently. Killing the rats is only a part of the process. In fact, you don't have to kill any rats if you don't want to, but you do have to get them out of the house - live options include cage trapping and relocation, or exclusion funnels. But either way, you'll have to do the most important work - finding the rat entry holes into the house, and sealing these holes shut. The best way to kill rats without using poison is yes, the good old wooden snap traps. I've done thousands of rat jobs, and tried dozens of different techniques, traps, and devices, and by far, the best way to kill the rats is with wooden snap traps. In fact, I've tried many natural approaches, and no-kill approaches, and these aren't very effective. The rats are going to die if they can't live in your attic - they will die with no safe shelter - so they may as well be killed. The best way to kill rats naturally is to simply block them out of the house. You don't even need to keep your yard clean and free of debris and garbage. And forget about using a Rat Repellent - there are absolutely no repellents that will drive out rats, because again, if they leave their (your) home, they will die outside. You just need to block them out of the house, and voila, rat problem solved. I wrote this website to provide information on How to Get Rid of Rats in the case that you have a rat problem and need to make an informed decision about what to do. If you have any questions you may email me, but I do know from experience that rat removal is not simple. If you need professional help solving your wildlife conflict, I recommend that you talk to a professional rat control expert in your town by clicking on my National Wildlife Control directory, which lists experts who I recommend in every USA city and town who can help you with your rat issue. Rats and rodents are perhaps the most dreaded and loathed creature in the planet. These little creatures cannot be easily seen as they dwell in the dark areas of the house or infrastructures and knows how to create their own way inside. They are said to be carriers of disease and parasites which can affect both humans and animals alike. They have high survival ability that it is difficult to totally eradicate them. Basically there are two types of rat management. One is through the use of poisons or pesticides. These chemicals need to be induced before it can actually take effect but there are also some possible negative results in using them. First not all rats would eventually eat the chemical baits that you placed and not all that ate it would eventually die. There is a tendency that some of them may develop antibodies to fight off these chemicals and eventually be resistant to poison that would help them evolve into something much more difficult to manage. Another thing is those that might have been affected by the toxin would not likely find a place to die so they basically end up dying and rotting in any particular areas of your homes which in turn would end up a smelly inferno especially in hot weather when their bodies would not be found and properly disposed of. It would also attract other parasites to feed on the rotting rat carcass and would eventually stay in your house adding up another problem to your pest infected home. The other type is just setting up a trap which is considered by many people as the most effective method of disposing their rat problems. 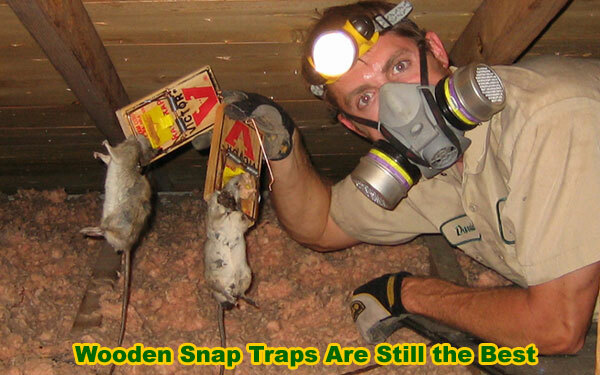 Snap traps are just easy to use but would require a lot of manual labor to dispose of them. You can also use it again and again so you can save much on using it compared to using poison which can be used one time. The only thing you have to remember is trying to place it in strategic location where they usually go out to hunt for food. Chances are you would only capture the older ones and leave the young ones inside their holes because they are too young to do the hunting. You can try to use as many traps as possible but remember that rats might not take into traps again if you fail the first time. To avoid this, you should first try to put baits on the traps without setting them and allowing the rats to take the bait overnight that way they won’t be aware of the possible danger awaiting them and would eventually return the second time. It also helps to know whether there are a few more rats inside the house if you see that there are a number of traps with baits remained untouched. In reality though you can’t be expected to kill every rat in your area since there are several millions of them hiding somewhere and just needs a little more time to surface and invade your homes. Killing a few ones wouldn’t really stop your problems all together because there will just be new rats coming in to drive you mad. What you can do best is preventing the problem rather than controlling it. The best way to do this is by making sure that all possible entry areas in your house or establishment is sealed or at least covered with materials that would block them from entering your home. One other thing to do to best avoid the return of this nuisance pests is to make sure that your house and surrounding area is clean and well maintained that way there will be no possible stimulant that might lure them into your property. Keep garbage in containers that is tightly closed and make sure that all food trays of your pet animals are clean and kept in storage after they eat so as not to give these rats a reason to invade your house. If you are growing trees and plants in your house, just make sure that you don’t have vines to give them easy access in climbing into your roofs.